Here is a simple German menu that you may easily find at lunchtime in a restaurant, a cafeteria or at home. These recipes should be very familiar to your German friends. They are easy to make and not exotic, but will give you a good feeling for the different tastes in this cuisine. 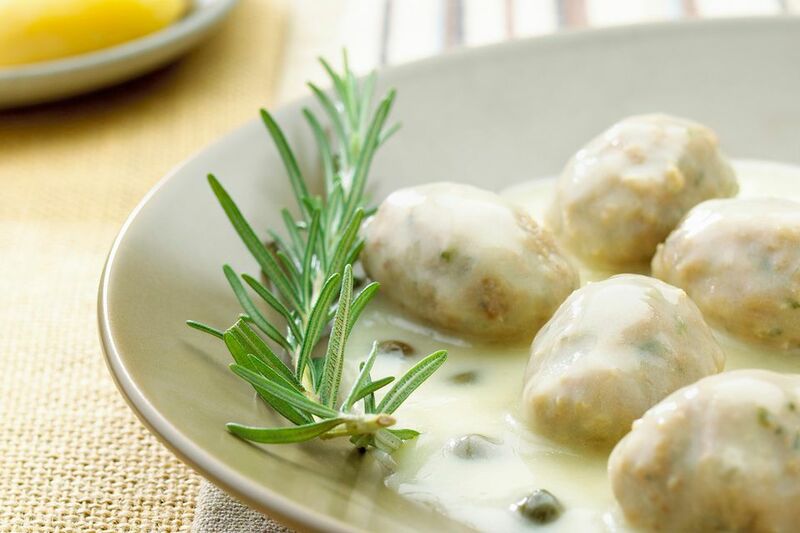 These are meatballs in a white sauce flavored with lemon juice and capers. Yes, they originated in Königsberg (now in Poland) but are now found all over the country. Note that ground meat recipes usually have at least two different meats. Most often it is pork and beef, but it may include ground veal or lamb, or sometimes fish. Although not a “recipe,” I had to include instructions for Dampfkartoffeln because there weren’t any when I was a Hausfrau (housewife in Germany) and I always thought there should be. Gruene Bohnen are a regular side dish for the German plate. Here I have included a basic recipe, but there are variations including cream, sour cream, bacon and onions, and many casseroles rely on them as well. Gurkensalat is another well-known side dish that is also low in calories. for dessert, a simple fresh-cheese dish, Quarkspeise, slightly sweetened and with fresh fruit. Germans do not use as much sugar in their sweet dishes as we do, so you may need to add sugar to taste. German Meatloaf With a Surprise Inside!